Bringing 100 thoroughly vetted employees into an organization in under 60 days seems like an insurmountable task. In fact, in today’s climate it can often take up to three months just to find the right candidate to fill one single position. However, in the Fall of 2014, Jason Jeffreys, then acting senior manager for Enterprises Services for LinkedIn, was faced with this monumental task: creating a brand new department outside of his division that would include 100 new full-time employees before the end of the year. It would be three whirlwind months like he had never experienced before, but against challenges he worked alongside the talent acquisition team at LinkedIn and made it happen. In late September of 2014, LinkedIn’s sales organization decided they wanted to create a brand new department outside of sales “that would serve as a compliment to sales by focusing on customer engagement and churn prevention,” explains Jeffreys. The department would employee 100 individuals called Customer Success Representatives who would work with small business customers. 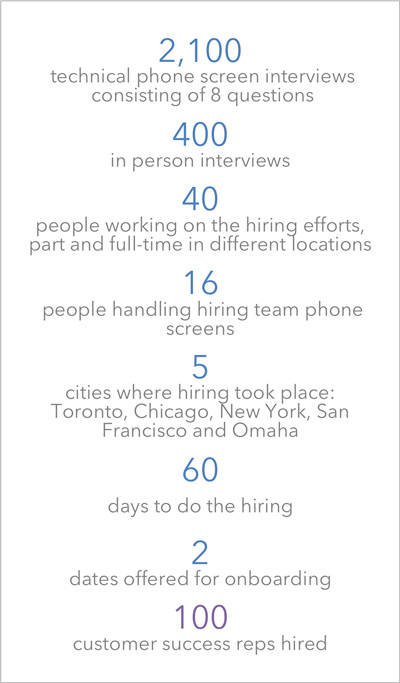 The hiring was to be accomplished in five different locations: New York, Toronto, San Francisco, Chicago and Omaha. Although Jeffreys’ department was outside the scope of this new role, his team had piloted the new position and was therefore given ownership of the project. To further complicate matters, in order to meet sales strategies for the beginning of the first quarter, he was told that this undertaking all had to be accomplished by the end of the year. “When I first heard about the project I couldn’t help but think how much work this would be, especially given we were not anticipating this project and needed to continue filling other positions,” says Lauren Babek, who as the Talent Acquisition Manager worked alongside Jeffreys to help find the talent. One of the most critical things Jeffreys and Babek did at the outset was establish a hiring team of colleagues who were already on the same page. This group of stakeholders would oversee the project in terms of conducting interviews and making assessments. “Our success started with having this core group of people that were all in alignment with one another,” Jeffreys shares. “We already knew how one another assessed talent, because we had already been through that together. That allowed us to have a lot of trust in one another,” which would save them from having disagreements down the road. In addition to the TA team overseeing the hiring—consisting of Babek and Jeffreys and other recruiting staff working under Babek—they also needed to leverage numerous staffers from a variety of teams to screen thousands of candidate calls. For this task, Jeffreys and his team picked 16 people to pitch in on screening candidates, alongside their usual full–time duties. Jeffreys relied on employees in two outside departments, sales and customer service, who were already familiar with the functions of the new role, either because they had performed similar duties, or because they would be interacting with the new team in the future. For a period of several weeks, these “screeners” dedicated anywhere from five to ten hours a week screening new hires, in addition to their day jobs. “We were really selective in who we brought into the process to ensure that there was a very consistent voice when evaluating candidates,” says Jeffreys. Another key factor was transparency and good communication when it came to determining the job description and specifics. After meeting with stakeholders, “the team aligned on the job requirements, agreeing that the Customer Success Rep would need a four-year degree as well as two years experience in either sales, account management or recruiting” says Jeffreys. Next, they met with the recruiters several times to have Q&A sessions, so that everyone could ask clarifying questions and discuss the candidates that would be coming in. Babek shares that, because they hadn’t yet created “career performance profiles” for the positions, they had to bring various business partners together to quickly agree on things such as compensation, performance metrics, career pathing, and promotion guidelines based on everyone’s expectations and understanding of the role. When it came to finding candidates, “we were drinking our own Kool-Aid,” says Jeffreys, who consulted with Babek and her team to source candidates both through LinkedIn Recruiter and through job posts. “We also had a fairly decent number of referrals,” he shares. “Our largest candidate pool ended up being passive candidates we found through LinkedIn Recruiter,” shares Babek. “We worked hard and smart to get folks engaged in each hiring location, given the time constraints of the project. During this phase, Babek and her team were able to source 2,100 candidates that met the qualifications and moved forward to an initial phone screen with the recruiting team. For the interviews, they settled on a standardized review and scoring process and made adjustments to it as they went along. For the first screen call, they implemented a scoring system of 1-3 points. They made this adjustment after analyzing statistics and seeing that 90% of candidates who scored a three on the phone screen always made it to the hiring manager. “It was a really abbreviated process for what you might typically see at LinkedIn, but we did that knowing that we had to make close to 100 hires before the end of the year,” says Jeffreys. When someone scored a two on a phone screen, they would go on to a second phone interview with a member of the hiring team to further assess their skills and qualifications. These interviews included a consistent scoring system, as well as a set of standardized questions. Then, those that scored at least 14 out of a possible score of 20 went on to the onsite “batch” interview week. The next interviews were conducted during marathon batch interview weeks, when the core interview team would fly to one of the hiring locations and spend five days interviewing 30-40 candidates who had been vetted. In order to streamline and simplify the onboarding process and ensure the teams were in place by the deadline, they offered only two different onboarding dates to new hires, one in the middle of December and one in the beginning of January. Next they had to create two-week group training sessions for each team of new hires because it was an entirely new job. To create the program, they worked closely with both sales and the customer service department to ensure that the new hires would be successful.